1920s Betty & “Kurlie” in front of tavern. Private Collection. 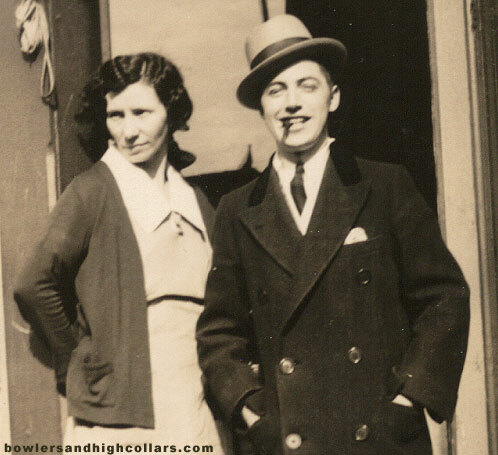 “Kurlie” with the cigar and flashy smile under the homburg was dressed to the nines! The Free Lunch sign tells us these two were in front of (what used to be) a tavern. Since prohibition started January 16, 1920 this either was taken across the Canadian border or they were in the U.S, the sign is outdated and this is now a speakeasy! Betty is simply dressed and seems a little nervous and camera shy checking out the street! By contrast “Kurlie” the peacock is all too eager to show off for the camera! Oh, and the spats! I’ll bet a whole American dollar this one was a character. This entry was posted on Friday, April 24th, 2015 at 12:59 am	and tagged with 1920s, fashion, fedora, gangster, overcoat, smiling, speakeasy and posted in Bad Boys, Others. You can follow any responses to this entry through the RSS 2.0 feed.